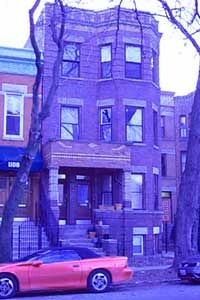 East Village Association | West Town Chicago: East Village Landmark District: When are renovations wrong? East Village Landmark District: When are renovations wrong? Recently there has been a spike in illegal window replacements and other alterations in violation of the city's landmark ordinance. When the city reviews a construction project in the East Village Landmark District, the Department of Planning and Development issues a summary of "approval conditions" that outlines the approved work. The following summary of approved work in the East Village and Ukrainian Village landmark districts has been excerpted from the city Landmarks Division approval summaries for the past 12 months. Work not listed or in conflict with the description should be reported to the 311 city-service hotline. 3/22/2007 Renovation/alteration - basement and 1st floor conversion from commercial to residential use per Landmarks stamped plans dated 3/22/07. For all windows the existing vertical mullions between ganged double-hung windows shall remain in place and be repaired as required. The existing brick molds shall be repaired to match existing in size and profile. Brickmolds and trim shall not be covered over with metal or other materials. New brick shall match existing brick in size, color, textrue, etc. Tuckpointing mortar shall match existing in type, color and joint profile. Brick sample shall be submitted to Landmarks staff for review and approval prior to any work. 5/9/2007 Interior work only on the 2nd and 3rd floors only as per Landmark stamped plans dated 05/09/07. NO CHANGE TO EXISTING WINDOWS, STREET FACING FAÇADES, STOREFRONTS OR ROOFLINES ALLOWED WITH THIS PERMIT. 9/13/2007 Exterior: Mechanical equipment replacement and HVAC work as per plans 2nd and 3rd floor only as per Landmarks stamped plans dated 13 September 2007. No other work allowed with this permit. 5/8/2007 Exterior only: Repair brick arches on Thomas facade and repair and replace as necessary limestone base on the same facade. All brick to be reused. New mortar to match historic in regard to joint width, color, and finish. New imestone to match existing and not to exceed 16 linear feet. No window replacement or other work to occur with this approval. Photographs were reviewed with this application. 10/16/2007 Exterior work only: Architectural surface cleaning using dry grinding and tarpaulin for dust supression. Care to be taken not to damage surrounding masonry or mortar. No plans were reviewed with this permit. No other work to occur with this permit. 5/11/2007 Exterior: Remove and replace existing porch and stairs, same size and location as per Landmarks stamped plans dated 11 May 2007. No window replacement to occur with this permit. No other work allowed with this permit. 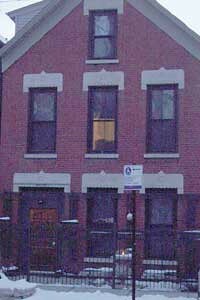 2/27/2008 Exterior: Erect a detached frame garage, 20'x20' with two 1-square-foot roof vents; alley access. No window replacement or work allowed to the residence. 11/23/2007 Flat roof recover only - no structural work. NO NEW NEW RAILINGS AND NO ROOF-TOP ENCLOSURES ALLOWED WITH THIS PERMIT. NO CHANGE TO FAÇADE, WINDOWS, OR DOORS ALLOWED WITH THIS PERMIT. 11/6/2007 Exterior only: Repair wood porch, same size and location per Landmarks stamped plans date 11/06/07. No window replacement or other work permitted with this approval. 11/15/2007 Fence: Construct 24 linear feet of new 6' high wood fence at the alley of a mid-block property per Landmarks stamped site plan dated 11/15/07. No other work permitted with this approval. 12/4/2007 Electrical only: Install new electrical meter at the rear of the home. No plans were reviewed with this permit. 10/12/2007 New Construction: Conversion and addition per Landmarks stamped plans dated 10/12/07. All vertical and horizontal window mullions to remain and be repaired. Project to include new front porch, new windows, rear additions, and rear attached garage. 1/17/2008 Mechanical: one meter, 100A temporary service. No window replacement or other work allowed. 2/7/2008 New Construction: Erect detached frame garage (27' x 20' x 12') with alley access. Garage to be located behind house on mid-block lot. 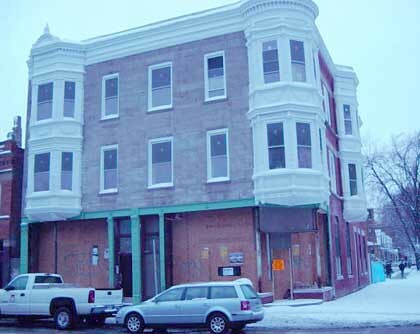 3/6/2007 Interior and exterior: Renovation of existing 6 dwellings unit masonry building with new rear porch, stairs, and rooftop mechanical penthouse per Landmarks stamped plans dated 3/6/07. Water cleaning not to exceed 400 psi. Existing front door sidelights, transom and frame to remain. 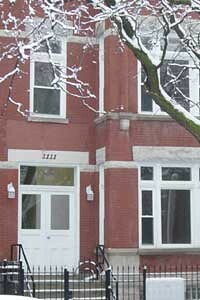 New windows to match existing and retain or replicate historic brick molding. 11/6/2007 Exterior: Relocated existing AC units from grade to roof. Revision to permit #100144462. No window replacement or other exterior work allowed with this permit. 3/29/2007 Erect a 6'-0" high wood fence at the rear yard only. No fence in the front yard approved with this application. No work to the building with this approval. 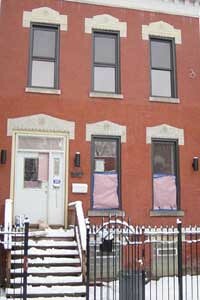 2/13/2008 Exteriors only: Replace existing rear porch with new 3-story open wood porch and stairs as per Landmarks stamped plans dated February 13, 2008. No window replacement or other work allowed with this approval. 11/28/2007 Exterior: Replace existing open wood porch same size and location at rear as per Landmarks stamped plans dated 28 November 2007. No window replacement or other exterior work allowed. 4/23/2007 Window replacement using wood windows on front elevation, does not include basement windows. Brickmoulds to be retained or replaced to match existing as necessary. No other work to occur with this permit. Plans were reviewed with this application. 3/30/2007 Exterior work only: Tear off and reroof with single ply modified and shingles. New gutters and downspouts. Roof coping tiles. If replacement of roof joists is required, new joists will be sistered to existing. If rebuilding of brick firewall is required, new firewall will be constructed at the same height and in the same materials as existing. No structural changes to roof allowed with this permit. No window replacement allowed with this permit. No plans were reviewed with this application. 12/11/2007 Exterior only: Repair existing rear open wood porch. No change in size or location. No window replacement or other work permitted with this approval. 9/24/2007 Mechanical: Install 20-amp circuit for vertical lift. No other work allowed with this permit. 1/15/2008 Interior only: Addition to existing permit #100145647 to install an interior enclosed vertical wheelchair lift in existing church per Landmarks stamped plans dated 01/15/08. No other work permitted with this approval. 5/7/2007 2 story rear addition, new dormers, and interior and exterior alterations per Landmarks stamped plans dated 5/7/07. Replace approx. 200 bricks at front elevation, new brick to match existing in color, size, finish. Tuckpointing mortar to match original in type, color, and joint profile. No other work to occur with this approval. 7/25/2007 Same approval conditions as original permit submittal: 2 story rear addition, new dormers, and interior and exterior alterations per Landmarks stamped plans dated 5/7/07 or 07/25/07. Replace approx. 200 bricks at front elevation, new brick to match existing in color, size, finish. Tuckpointing mortar to match original in type, color, and joint profile. No other work to occur with this approval. 8/9/2007 Exterior: Foundation underpinning to an existing single-family residence as per Landmarks stamped plans dated 8/9/07. No window removal permitted with this approval. Removal of front stairs to be permitted. 6/28/2007 Interior and exterior: New rear addition and rehabilitation of an existing masonry 2-story house with basement and new garage per Landmarks stamped plans dated 6/28/07. Permit includes selective window replacement with aluminum clad wood windows and new dormer additions. Decorative transom window on front façade to remain. Existing horizontal and vertical mullions to remain in place and be repaired. Existing wood bricks molds to remain and be repaired where possible. 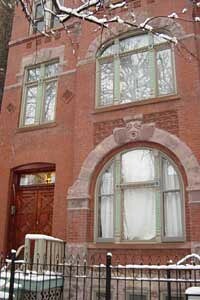 If repair is not possible new brick molds with profiles to match the historic may be installed. Existing front door and sidelight to be replaced with new double doors. 11/9/2007 Interior work only: deconvert existing 2 dwelling units into 3 dwelling units as per Landmark stamped plans dated 11/09/07. NO CHANGE TO FRONT DOOR OR WINDOWS ALLOWED WITH THIS PERMIT. 1/4/2008 Interior only: Replacing drywall and refinishing floors and associated electrical at a first-floor unit. No plans were reviewed with this approval. No window replacement or other work permitted with this approval. 11/15/2007 Exterior: Erect a wood frame garage 20x20x15 at rear of property. No work allowed to existing property. No other work allowed with this permit. 1/22/2008 Mechanical: Replace one water heater. 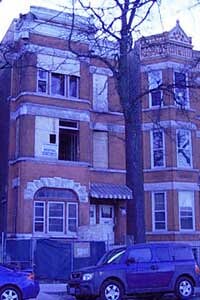 7/6/2007 Exterior only: Remove and replace six steel lintels on the south elevation, same as existing, and remove and replace up to 170 bricks on the secondary elevations, per Scope of Work dated 6/18/07. Mortar to match existing in regard to type, color, and joint profile. New masonry units on secondary elevations to match historic in regard to size, color and finish. No window replacement or other work permitted with this approval. No plans were reviewed with this approval. 4/4/2007 Exterior and interior: Four aluminum-clad wood replacement windows on the third floor per Landmarks stamped sketches dated 4/4/07. Historic brick molds to remain. Stained glass transom panel to remain. No other work permitted with this approval. 11/27/2007 Interior only: Alterations to basement per Landmarks stamped plans dated 11/27/07. No window replacement or door replacement permitted with this approval. 5/8/2007 Exterior only: Grinding and tuckpointing entire house. New mortar to match historic mortar in regard to joint profile, color, and finish. Care to be taken not to damage surrounding masonry. No window replacement or other work permitted with this approval. No plans were reviewed with this. 12/18/2007 Exterior only: Replace rear enclosed wood porch with new open steel porch to meet current building code per Landmarks stamped plans dated 12/18/07. No window replacement or other work permitted with this approval. 3/1/2007 Electrical only: 200 A Service upgrade (4) Apartment (1) Public. 5/4/2007 Exterior: Windows (replacement only) quantity: 22. 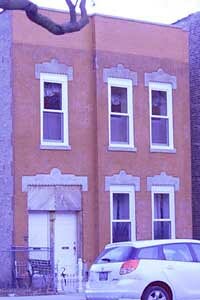 Five front windows wood clad; exterior brick mold remains. No other work allowed with this permit. 4/18/2007 Exterior: Install 4MM torch-down modified bitumen membrane. Apply aluminum coating. Clean up. No other work allowed with this permit. 8/7/2007 Interior and exterior: Interior renovation of existing residence, lower basement slab, new 3 story masonry rear addition, new rear steel porches and roof deck per Landmarks stamped plans dated 8/7/07. New front façade windows to be aluminum clad wood. Existing vertical and horizontal wood mullions and brick molds to be repaired and restored. Existing metal cornice to be repaired and restored. Project to include chemical cleaning with Prosoco Light Duty Masonry Cleaner per product specifications. Water rinsing not to exceed 400 psi. 8/22/2007 Exterior: Rehab existing 6 dwelling unit brick building; erect new 4 car masonry detached garage and 6' high, 4' by 10' wood trash enclosure as per Landmarks stamped plans dated August 22, 2007. New mortar to match historic mortar in composition, joint profile and color. New brick to match historic in EXACT size, color and texture. Brick sample to be submitted to Landmarks staff for review and approval prior to ordering and construction. No other work to occur with this approval. 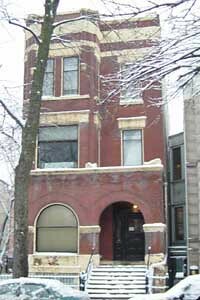 1/31/2008 Exterior: Revise existing 4-car masonry garage per Landmarks stamped plans dated 1/31/08. New Chicago common brick sample to be submitted to Landmarks staff for review and approval prior to ordering and construction. No other work to occur with this approval.This is a modification of permit #100179355 previously approved. 11/1/2007 Exterior only: Replace front door of a single family, 3-story residence per Landmarks stamped exhibits dated 11/01/07. Door to be paneled wood with a single pane of glass. Sidelights to be paneled wood with a single pane of glass. Transom to be included per exhibit. No window replacement or other work permitted with this approval. 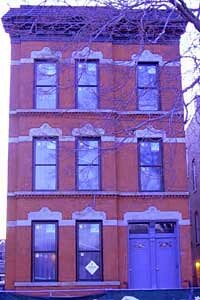 5/9/2007 Replace front façade vinyl windows (installed without a permit) with new aluminum clad wood double-hung windows in existing masonry openings per Landmarks stamped drawings dated 5/9/07. The round profile wood brick mold to be retained/replaced to match original profile and exposed, no aluminum or other panning to be installed over the wood brick mold/trim. No other work to occur with this approval. 7/9/2007 Exterior: New roof top deck and stairs per Landmarks stamped plans dated 09 July 2007. No window replacement to occur. No other work allowed with this permit. 4/27/2007 Exterior and interior: Total rehab of existing 6 dwelling units and new construction of porch as per Landmark stamped plans dated 27 April 2007. No window replacement on west bay and west façade. No other work allowed with this permit. 9/14/2007 Exterior only: Replace front windows and doors per Landmarks stamped sketches dated 9/14/07. New windows to be clad wood with decorative trim and mullions. Wood brick molds to be exposed and retained. New transom windows to be clear glass. New front doors to be paneled wood with clear glass. No other work permitted with this approval. 4/19/2007 Interior only: Interior removal of drywall and upgrade electrical. No plans were reviewed with this approval. 7/6/2007 Exterior and Interior: Interior alteration, new CMU block garage w/deck as per Landmarks stamped plans dated 06 July 2007. No work allowed to front façade. New mortar to match historic in color, composition and joint profile. New brick to match existing in color, texture and EXACT size. No window replacement to occur on primary façade. No other work allowed with this permit. 11/8/2007 Mechanical: Revision to existing permit to replace electrical contractor and scope of work to remain the same as building permit #100185225. 11/28/2007 Interior and exterior: Two dwelling unit, 2 story residential remodel/new finished basement per Landmarks stamped plans dated 11/28/07. 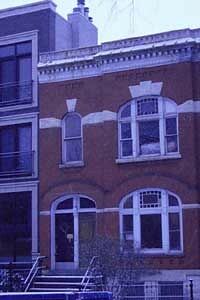 Project to include 2 new wood windows at the basement level front façade and removal of basement access stairs. 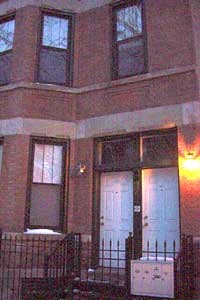 No replacement of existing windows and doors on the first and second floors. Yes; old windows must be preserved so that we may turn the area into a museum of poor efficiency window technology. Excess heat and A/C usage is a minor price to pay to honor our heritage. Landmark replacement windows are usually the better grade, efficient type. Guess what gets used when the work doesn't match the permit?